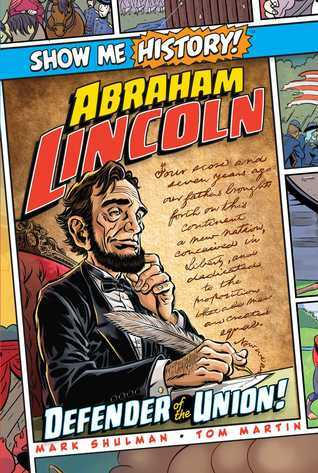 This graphic novel tells the history of Abraham Lincoln, from his childhood to his death, how he became president, his tragic family grief, and how he guided the American nation through the Civil War, and was ultimately assassinated. I loved this overview of Lincoln’s life! The cartoony artwork is colorful and bright, with lots of funny details in the background that bring the story to life. I think the writers did a wonderful job of condensing such a rich life story into so few pages, but still highlighting the most important and memorable aspects of Lincoln’s presidency and personal life. There were many details that I found interesting and engaging, as well as some cute jokes and anecdotes that were entertaining to read. I only found one mistake in the book. John Wilkes Booth is described as having a brother, named “Edmund” Booth, but I looked it up, and his brother’s name was Edwin Booth. I would recommend this book to readers aged 7-17. Any student of history would enjoy reading this excellent sketch of Lincoln’s incredible life and his impact on the American nation. Disclaimer: I received a copy of this book via Media Masters Publicity in exchange for a free and honest review. All the opinions stated here are my own true thoughts and are not influenced by anyone.